The point was reached. The boxes of baby clothes taking up space in the basement had to go. I tried selling them, no buyers. A week ago I felt the desire to just Pay it Forward with them instead. 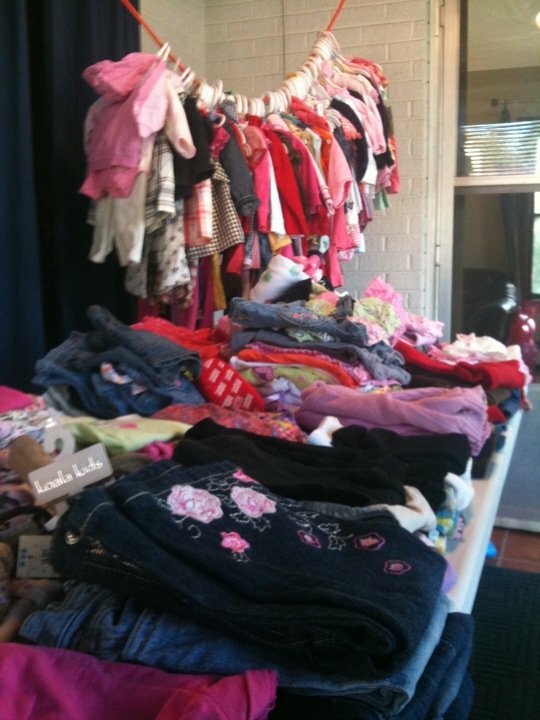 I put all the clothes on a table, emailed a few friends with babies, told them come on over take what you want for free but you must pay it forward. The day after one friend called to tell me that because I gave her free clothes for her baby girl she was able to give away a bag of her boy's clothes that she had intended on selling to buy girl clothes. High Five Sheri! I sorted the remainder of the clothes for three more friends along with 3 bags to donate to a teenage mom program and it felt so good! There truly is something to being a blessing to others. Last night I posted a couple things on Craigslist that I really wanted out of the house and within 10 minutes of the post they were sold! Today I met the buyer who saves dogs and cats from kill shelters! She has a new mommy cat that the shelter was going to kill all her kittens! The cage and litter boxes and other cat stuff she bought are going to great use. I came home with a feeling of joy in my heart. Pay it forward...you may reap a reward! I'm KimD, a mom, wife, and Woman. Former Chief Executive Power Professional to Executive Homemaker Mompreneur. I am learning as I go, taking the good with the bad, and setting my own Standards. Sometimes direct, humorous, tongue-in-cheek, sad, and serious, The Mom Standard is for folk who may not have planned to be parents, spouses, or Stay At Homes and are writing the rules as we go along. frugal living lessons in parenting executive homemaker recipe love husband no spend challenge toddler coupons motherhood shortycake creations Watkins DIY italian God friends farmers market homeschool preschool Coffee book review diet holiday anxiety disorder corporate homemaker movie review cupcakes free montessori how to wizard world chicago comic con ceo goodwill thrift store scores Bianca's Blessings Gift Donation cocktail klatch natural cleaning products waldorf foreign language worst.movie.ever. Books You Have to READ!